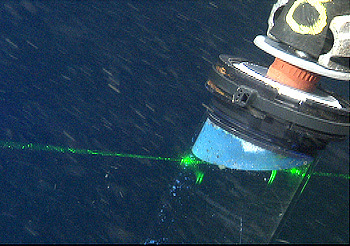 MBARI’s research vessel Western Flyer and remotely operated vehicle Doc Ricketts are on a three-week expedition to the waters off the coasts of Oregon and Washington. 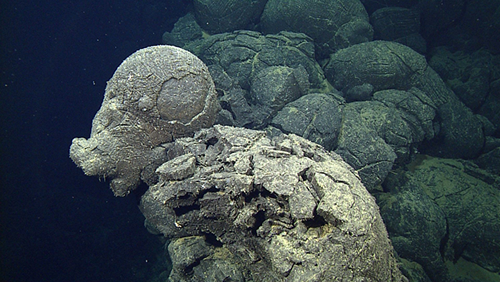 The Submarine Volcanism Project has been studying the formation of Axial Seamount for about 10 years. This year we have three subjects we want to address. The first of these is to characterize and map the new flows erupted about a year ago. This work involves AUV mapping of the upper half of the north rift zone followed by ROV dives to collect all the flows that remain unsampled. The second study is to determine the age, volume, flow emplacement style, and composition of several extensive lava flows on the distal south rift. These flows are so voluminous that their eruption may have led to collapse or formation of the caldera at the summit of Axial Seamount. We will study them by first mapping them with our mapping AUVs and then sampling the flows and the sediments on top to determine their compositions and ages. The third research topic is to continue to collect and analyze a two-meter thick section of volcanic sediments on the caldera rims. These deposits of volcanic fragments formed during explosive eruptions that were also symptomatic of caldera formation. 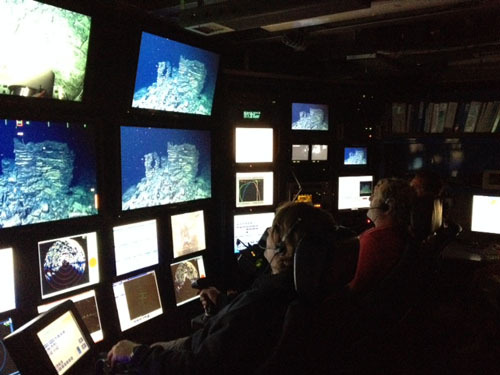 The Submarine Volcanism group is sharing the first leg of the dive program with the Molecular Ecology group at MBARI and the National Oceanography Centre in Southampton, UK. They are interested in understanding genetic differences that produce the extremely different body shapes (long and skinny or short and fat) of the vent tubeworm, Ridgeia piscesae. We are also studying similar genetic differences in two closely related species of palm worms, Paralvinella sulfincola and P. palmiformis, that live in different temperatures on vent chimneys. They will be collected at hydrothermal vent sites at Escanaba Trough, N. Gorda Ridge, N. Cleft, and the summit of Axial Seamount. In addition, water samples will be collected around vent fields to understand how chemosynthetic microbes and the larvae of benthic invertebrates that inhabit hydrothermal vents are distributed. Hydrothermal vents are really exciting to visit, especially since, with the exception of Axial Seamount, these sites have not been observed or sampled since the early 2000s so geochemical fluids will be sampled to determine changes in the systems over time. Many thanks to all involved in planning and carrying out this expedition! Successful ROV dive programs rely upon the ship’s crew, ROV pilots, and scientific party on board. Today's ROV dive at Guide Seamount, which is a little over 100 kilometers (63 miles) due west of Davenport, California, was quite exciting and much different than the dives conducted at Axial Seamount. The weather is predicted to deteriorate over the next couple of days. We decided it was best not to do our last scheduled dive at Axial Seamount today. Instead, we headed south last night to get ahead of the weather. The goal of today's dive was to sample lavas and take sediment cores on large flows located on the eastern flank of the South Rift of Axial Seamount. The ROV dive today covered lava flows of the April-May 2015 eruption on the mid-North Rift of Axial Seamount, in between those sampled yesterday and those sampled on August 1. 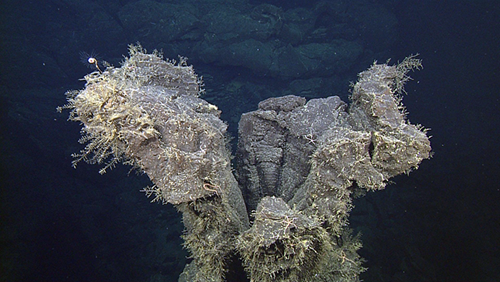 Today's ROV dive was full of surprises, and one of the biggest surprises for me was finding miniature black smoker chimneys near the top of one of the thick lava flows that erupted in April-May 2015. After a long steam from Newport, Oregon, we arrived to Axial Seamount about midday. Although we only had time for a short ROV dive, it was a very important dive for some of the long-standing work we have been doing here. We departed Newport, Oregon, at 7:00 a.m. in the fog and were welcomed back onto the northeast Pacific Ocean by surprisingly calm seas. We entered Yaquina Bay in Newport, Oregon, this morning in heavy fog. The sun broke out just as we passed under the iconic Highway 101 bridge. 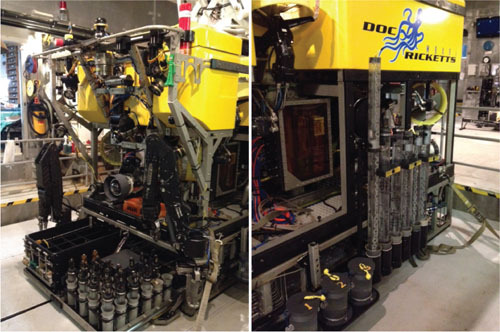 We began steaming for port as soon as the dive on August 2nd was completed and the ROV was on deck. The wind has kicked up again so our transit will be slow and would take too long to have allowed us to get a dive at another vent field today. The goal of this dive was to sample the different flows from the valley of the eruptive axis of the Vance Segment toward the eastern flank of the South Rift of Axial Seamount. Our dive today started with biology collections at the CASM (an acronym for Canadian American Seamount) vent site on the northern caldera floor at Axial. Today's dive started at the same point as our short dive yesterday at a hydrothermal vent site that was named "Vent 1" by the US Geological Survey (USGS) years ago. After a terribly long and miserable transit the weather calmed a bit and what was to be a quick test dive became an exciting reprieve from boredom, seasickness, and an otherwise helpless feeling that we’d never get any science done. Well, we are making progress! We will pass over the Blanco transform fault zone during the night and reach our first (fingers crossed) dive target in the morning. We are crossing the Escanaba Trough of the Gorda Ridge right now, five kilometers south of NESCA (Northern Escanaba Trough), where we were to have our first dive target of this expedition but the weather continues to be awful. The wind picked up all day and with it the swells. This evening we are now SW of Cape Mendocino and heading NNW at about five knots. Our departure was timed with the high tide and we slipped from the sleepy, foggy, calm waters of the harbor into Monterey Bay right on schedule.